Midwestern-born friends of ours admitted to being a bit confused at the hubbub advertised as the State Fair and held in the parking lot of the Meadowlands Sports Complex earlier this summer. I can't say I blame them: it wasn't a real state fair, with 4H exhibits, tractor pulls and judged livestock shows. That's held at the Sussex County Fairgrounds in August. The other one, technically named "State Fair Meadowlands," looks like a street carnival on steroids. No self-respecting livestock would step foot there. Excuse me. Can you tell me how to get to the PATH train? Interestingly enough, the East Rutherford version was a bit closer, geographically, to the first permanent home of New Jersey's premier agricultural exhibition: Newark. Yup, the state's largest city was once the place where farmers and their families learned the latest about livestock and crops, enjoying fun and games while they were at it. Technically, the site of the fair, the current-day Weequahic Park, was in Clinton, an small community that was yet to be absorbed by Newark. In the years before the site became a county park, it was largely farmland, neighbored by marsh instead of apartment buildings, highways and train tracks. Clinton had a better deserved reputation for breeding mosquitoes than for crop production until James Jay Mapes came to town. A noted scientist with an interest in agriculture, he purchased an unproductive farm there in 1847 as a laboratory for his theories in crop rotation, fertilization and seeding. His work wasn't just successful, it proved the value of scientific agriculture in improving soil quality and crop yield. Though many farmers had scorned 'book farming' before, the results were undeniable, and Mapes became the closest thing to an agricultural rock star as was possible in the mid 19th century. Who wouldn't want to boost production on their own acreage, and who better learn from than the master himself? Mapes took to the speaking circuit, drawing on his considerable wit and speaking skills to present over 150 lectures on scientific farming. He also patented and sold his phosphate fertilizer branded as, what else, "Mapes Fertilizer." The farm in Clinton became a popular draw for knowledge-hungry farmers, so much so that in 1866, the organizers of the New Jersey state agricultural fair chose it as the event's permanent site. Besides the usual seminars, shows and competitions, farmers and their families could enjoy food, drink, shows and games of chance at the newly-dubbed Waverly Fairgrounds. The grandstand and racing oval constructed for the fair proved so durable that it stood until 1960, evolving from a horse track to automobile racing. Clinton's days as the capital (at least for a few days a year) of New Jersey agriculture ended in 1899, as Essex County amassed several tracts of land to become present-day Weequahic Park. The last bits of the township were annexed to Newark in 1902, completing a process that had gone back and forth for close to 70 years. In any case, the years of moos, manure and midways were over for the park, but it would later host significant events, including a celebration of the city's 250th anniversary in 1916. Wait a minute, Bunol, Spain. You may have La Tomatina, but you don't have the Great Tomato Tasting. Both happen on the last Wednesday in August, but we New Jerseyans celebrate our tomatoes by sampling their deliciousness, rather than letting them get overripe and then throwing them at each other in some sort of wacky bacchanalia. Well, some of us do, anyway. For several years I've been meaning to head to Pittstown, where Rutgers and the New Jersey Agricultural Experiment Station and Cooperative Extension host the annual open house and tomato tasting at the Snyder Farm Research and Extension Farm. This year I finally made it, and if it's possible to overdose on tomatoes, I think I did. Before I get into that, however, a few words about the farm itself. Originally, the 390 acre property was owned by Cliff and Melda Snyder, well-known in the community for their embrace of the science of agriculture and the technology that proved to help farmers increase yield. Cliff was the longtime president of the Hunterdon County Board of Agriculture, while Melda served both there and was director of the New Jersey Farm Bureau. Both welcomed their colleagues to the farm to learn more about advances in agricultural science. 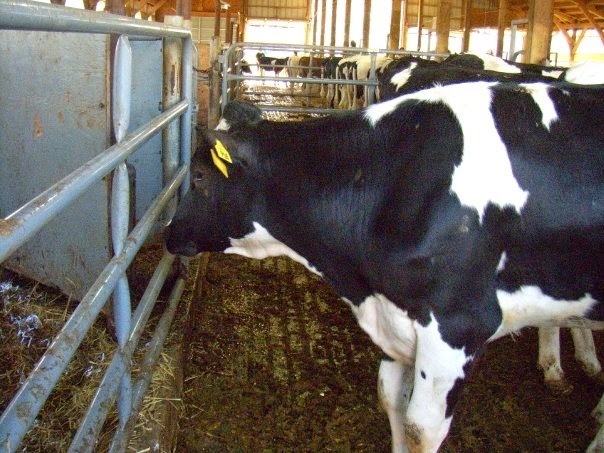 When Melda died in 1988 (Cliff had predeceased her 20 years earlier), she bequeathed the farm to Rutgers, which has transformed it into a research facility to foster sustainable agriculture. In other words, while the farm's staff works to develop crop plants to keep New Jersey farms profitable, there's a strong emphasis on environmental responsibility and educating the public. The farm itself is a bit off the beaten track -- take Route 78 to Clinton, then some country roads that bring you into Pittstown and beyond, passing a good amount of working acreage along the way. Rather than a broad expanse of one or two crops, the Snyder farm has a wide variety -- corn in one area, small orchards of apples and peaches in another, as well as other crops. It's kind of like a gardening hobbyist's fantasy, except that research scientists are closely controlling and monitoring the conditions. No, that's not a small watermelon. It's a grape tomato called Lucky Tiger. Pear tomatoes. They had red ones, too, but these were more fun. Imagine the sauce from this one! the fruit before cutting it into sample chunks. I lost count of my samples somewhere around 40 and felt a sudden need for something, well, NOT tomato. Fortunately several other tables were offering alternatives, including exactly what I needed: basil. Mixed with small bits of tomato, mozzarella and a dash of olive oil (we're in New Jersey, after all), it was the perfect palate cleanser. But then there were the peaches and the melon and the apples and the honey and even hazelnuts. The only thing missing was blueberries, whose season has already passed. A few bushes were still bearing fruit in the display garden, but I resisted the urge to pluck a couple of berries and run. Needing a break from noshing on healthy food, I jumped on a hay wagon for a narrated tour of the research fields. A volunteer Rutgers Master Gardener shared insights on the studies being done at the farm: peach trees that grow more vertically to increase the number of trees that can be planted on a tract, the relative effectiveness of various fertilizers on corn (chicken guano seems pretty helpful, whole milk not so much), halting the impact of basil downy mildew on one of my favorite herbs. And in one very special area, researchers are monitoring the progress of their efforts to recreate the Rutgers tomato originally hybridized and introduced by the school in 1934. As I marveled at the number of apples and peaches hanging tantalizingly from the trees, our guide noted that the farm donates about 30 tons of harvested fruit and vegetables to food banks every year. Some fruit, she admitted, was left beyond the electrified fence to bribe deer to stay out of the farm and away from the plants. I may have gone for the tomatoes, but I left feeling even prouder of our state's flagship university and its agricultural extension program. The folks at the Snyder farm are living up to the example of the folks who donated the land, finding new and more responsible ways for Garden State farmers to provide us with healthy, abundant produce. And, well, I ate enough fruit and vegetables to make my parents beam with pride. But I have to admit: on the way home, I stopped for some mutz and focaccia. There's only so much tomato I can eat without bread and cheese. Today it's the site of a wine store, but back in the day, 163 South Street in Morristown hosted one of the nation's most progressive educational institutions for young women. No historical markers commemorate the site, but Miss Dana's School for Young Ladies deserves note as an incubator for independent thought for women of the late 19th and early 20th centuries. I wish I could say I discovered Miss Dana's totally on my own, but getting there was more like a scavenger hunt than a field trip. Our friend Joe Bilby, co-author of 350 Years of New Jersey History, From Stuyvesant to Sandy, mentioned Dorothy Parker's birthday as one of the historical nuggets he regularly posts on the National Guard Militia Museum of New Jersey Facebook page. Research on the Algonquin Round Table wit led to Miss Dana, but more on that connection later. As we learned when we stumbled on the site of the Bordentown Female College, women's education in 19th century America generally took one of two routes. Some of the institutes, seminaries or colleges founded exclusively for girls focused on the type of higher education that we're familiar with today. Others were basically finishing schools that prepared daughters of wealthy parents for their entry into polite society, teaching manners, literature and the culinary arts so they could have a decent conversation with their future husbands and neighbors. Parents could send their daughters to Miss Dana's with the assurance that if the girls took to their studies, they'd be assured a path to further success at one of the nation's top women's colleges. Graduating from her school meant an automatic acceptance to Vassar College, with no other entrance requirements necessary. Unlike her predecessors at the Morris Female Institute, Miss Dana had a penchant for excellence that transcended the classroom. As one indication, in 1893 the school became the first in the state to hire a resident nurse. Marietta Burtis Squire was at the top of her field; at other points in her career she was the first president of the State Board of Examiners for Nurses and Superintendent of the Orange Memorial Hospital. Elizabeth Dana died in April 1908, having prepared a few hundred women for higher education and productive lives. The school closed four years later, but her legacy lives on. Just after her death, students and alumnae endowed a reading prize in her name at Vassar, which the college continues to award to the student who undertakes and completes the best independent reading project over their summer break. So what's the connection to Dorothy Parker, poet, author and satirist? Born in Long Branch as Dorothy Rothschild, she lived with her family in Manhattan but boarded at Miss Dana's after a stint at a Catholic school in the city. (She joked that she was encouraged to leave after characterizing the immaculate conception as "spontaneous combustion.") She graduated in 1911 as part of the school's last class. Her biographer, Arthur F. Kinney, suggests that the education Parker got in the Morristown school may have influenced her worldview and political interests. As he notes, the weekly current events discussions during her senior year "focused on such themes as exploitation in the slums, reports of muckrakers, and the growth of the Socialist party." The final issue of the school paper before her graduation included articles on child labor in American sweatshops and U.S. expansion in the Pacific region. One has to wonder how many other girls' schools in that day were encouraging that kind of discussion. While finishing schools taught young women how to conduct a pleasant conversation, Miss Dana encouraged her students to think for themselves. She was well ahead of her time. Our visit to Ledgewood's historic King Store opened our eyes to the retail world of a small community along the Morris Canal in the 19th-early 20th century timeframe. A walk next door to Theodore King's Queen Anne/vernacular style homestead led us to an experience which, if it were a shopping destination, would be a mall with surprisingly varied stores. I expected it would give us a view into the merchant class, much as the store had represented the community and transient customers, but the mix of exhibits led me to think about a lot more than that. probably added on after the house was built. One of the things I love about local house museums is the stories they tell through the hodgepodge of artifacts they display, and the King homestead is no exception. The buildings themselves are sometimes the only place where small historical societies can show their diverse collections or share what's remarkable about the community. From their perspective, I'd gather the arrangement is often a blessing because they don't have the resources or sufficient artifacts to interpret an entire house for one given era. In my eyes, museums like these are one-stop wonders where I can learn what local residents find most remarkable about their own communities. The King homestead is kind of like that. Built in the mid 1880s with the proceeds of the entrepreneur's many businesses, it now serves two purposes. Walk up across the broad, inviting porch and into the house, and you can turn to the left to learn about the King family and their life there, or check out the rooms on the right for a view into the history of the Roxbury area. Or both. Heading to the left, we were greeted by Roxbury Historic Trust President Miriam Morris, who led us through the house, narrating its history and the Trust's efforts to bring it back to its former glory. The Roxbury Rotary stabilized the home after they finished work on the King Store, upgrading utilities and fixing the chimney before turning the property over to the Trust. As you walk around, you see places where more work needs to be done, but the overall impression is of visiting a very much lived-in older relative's home, complete with vintage and antique furniture. Theodore King's small office stands just off a corner of the parlor, ready to receive business, but the home feels more like the dominion of his daughter Emma Louise, the last of the family to live there. There's even a collection of Depression glass laid out on the dining room table, a temporary exhibit that underscores another facet of life in the community over the years. The dining room offers a pleasant surprise: a wrap-around mural of a pastoral scene, with lovely trees and some grazing cattle. Painted by British artist James W. Marland in 1935, it may include elements of the scenery that once surrounded the house, though it's more reminiscent of English countryside. Not much is known about the artist, who first arrived in the United States in the early 1900s and seems to have settled in Morristown and Budd Lake several years later, returning to England just before his death in 1972. As part of its research on Marland, the Trust is looking for additional surviving examples of his work in the area. Miriam mentioned that he'd done some additional work in the bathroom and had stencilled the upper walls of one of the upstairs bedrooms. Heading to the other side of the house, we got another surprise. A full room contains an exhibit inspired by the Minisink Trail, the Lenape thoroughfare that predates Main Street, the road on which the house and store now stand. As one of the signatories of the 2010 Treaty of Renewed Friendship with the Lenape Nation of Pennsylvania, the Trust is committed to sharing the tribe's history and relationship with the region. In particular, the room's exhibit covers the forced departure of much of the Lenape population from New Jersey and the re-emergence of the community despite the common belief that no natives live here. Closer to the front of the house, the rest of the Ledgewood/Roxbury area gets its due through the "Heels, Wheels and Keels" room. Drawn on the walls is a representation of the transportation routes through the area: the Minisink Trail, early 19th century turnpikes, the Morris Canal and current-day highways. Reflecting the "innovation" portion of the theme for New Jersey's 350th anniversary, a temporary exhibit highlights the inventions and technology developed in the area and by local residents, a good part of it from AT&T and Bell Labs. Like the King Store, the homestead is open only once a month, on the second Sunday afternoon of the month from April through December. It's well worth a visit, not just as a symbol of how New Jerseyans lived and worked, but as a great example of the classic community museum. Stop by and tell them Hidden New Jersey sent you! Morris County's old Ledgewood Circle is no more, but if you follow a couple of small brown directional signs to the Drakesville Historic District, you'll find one of the earliest remnants of what made this crossroads the focus of a rural community from the heyday of the Morris Canal until the early 1900s. Just off the intersection of Routes 10 and 46, the Roxbury Historic Trust is in the process of restoring the King Store and Homestead. Hidden New Jersey friend Kelly Palazzi suggested we check it out, but it wasn't easy: the property is open only on the second Sunday of the month and is closed entirely from January through March. on the porch of the old King Store. Our welcome to the King Store was probably a lot like the one a canal boat crew would have gotten in the 1800s: the proprietors were standing in the doorway of the stone building and called out a greeting as we pulled up. Walking onto the porch and into the store was like stepping back in time: the interior was lined with wooden shelves, groceries and sundries of a previous age stocked here and there. A cast-iron stove stands in the center of the room, just in front of a large scale, and a tall set of cubby holes near the door sufficed as the community's post office. In the back room, the wooden doors of a large icebox are open to help visitors imagine how milk and other perishables were kept fresh in the days before refrigeration. Our friendly guides explained that the store was built around 1826 on what was then the Essex-Morris-Sussex Turnpike, one of the first roads chartered by the New Jersey Legislature at the start of the 19th century. The original owners, the Woodruff family, operated the store until 1835 before closing it for unknown reasons. Two years later, canal boat owner Albert Riggs bought the property and reopened it to serve the local community and the increasing traffic through the nearby Morris Canal lock and two planes. Riggs transferred ownership and operation of the store to his son-in-law Theodore King in 1873, and the new storekeeper and his wife Emma moved into the living quarters above the mercantile. Brands of the past find their homes on the King Store shelves. Though competition from the railroads was already digging into the canal's business, King was on his way to prosperity. Besides the popular general store, he got into the mining business and bought significant tracts of land, some of which he sold at a handsome profit while retaining the rest as vacation rental space. He also operated hotels and a steamboat company to cater to the tourist trade at nearby Lake Hopatcong. The proceeds from all of these businesses enabled him to build a comfortable Victorian home on the lot next to the store, where he could keep an eye on business while enjoying time with his wife and their daughter, Emma Louise. King died in 1926, and with him the store. His daughter simply locked the door, leaving the goods sitting on the shelves. Dwindling traffic on Canal had ended with its termination a few years before. According to our guide, family members would come in from time to time to take items they fancied, but for the most part, the building was a de facto time capsule. Louise King divided her time between New Jersey and Florida until her death in 1975. A few years later, the Roxbury Rotary Club took on the store as a civic project, clearing the overgrown, weeded lot and acquiring state Green Acres funding to buy the property for the township. Now the responsibility of the Roxbury Historic Trust, the King Store is slowly being restored; a new slate roof is the latest improvement, along with a refurbished scale sitting next to the porch. While work clearly needs to be done to stabilize the structure to prevent further decay, there's much to be said for keeping a good part of the current look. Too much paint and varnish would take away the character of a classic general store. As it stands, it doesn't take much to imagine a local farmer or canal mule tender at the counter, ordering supplies and settling his bill. The next stop on our visit to historic Drakestown was the King house, just next door... but that's a story for our next installment. Last week's visit to Bayonne revealed more than an interesting avian visitor and a surprisingly highbrow golf course. 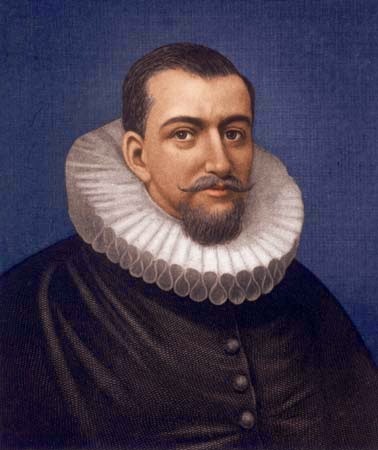 A small sign at the start of the Hudson River Waterfront Walkway revealed that Henry Hudson himself might have been the first to discover the site's ornithological gifts. Equally as interesting, my research revealed a truly hidden morsel of Dutch-American heritage lurking within the city's industrial heart. I guess I shouldn't have been surprised to read that Hudson anchored his ship, the Half Moon, not far from the site of the current-day walkway when he first visited the area. Histories of early New World visitation by European explorers credit the English-born, Dutch-employed sea captain with discovering New York Harbor, Manhattan and the river that was later named for him. They don't say much, if anything, about the place where he parked the craft after sailing through the Verrazzano Narrows upon his arrival in September 1609. As it turns out, it was at a bulge along the peninsula between the river and the Kill van Kull, now known as Constable Hook in Bayonne. Hudson reportedly called the area Bird Point in recognition of the prevalence of gulls at the site. In fairness, the Dutch West India Company wasn't paying Hudson to look for birds, but for the northwest trade route to Asia. According to the First History of Bayonne printed for the 250th anniversary of the city's settlement, the local natives were both friendly and generous. Members of the Raritan branch of the Lenape tribe "visited his vessel daily, bringing furs, oysters, corn, beans, pumpkins, grapes and apples to trade." The dense forests of the area were home to an abundance of animals including panthers, bears, snakes, beavers and rabbits, making the region even more attractive for settlement and establishing trade. Some of the encounters between natives and newcomers turned violent during Hudson's 1609 visit to the area, but I couldn't find accounts of any disputes at Bird Point -- it's possible they might have occurred on nearby Staten Island or perhaps farther south near Sandy Hook. What is known is that Hudson stayed near Bayonne only for a short time, leaving to explore the river route clear up to present-day Albany. The Bird Point peninsula remained solely in Lenape hands until 1646, when the Dutch West India Company granted the land to constable Jacob Jacobsen Roy, who apparently never did anything with the property. Instead, the tract lay unchanged until about 1700, when Pieter von Buskirk arrived from Manhattan to build a house and start a farm. About 35 years later, he buried his wife Tryntje nearby, starting a family cemetery that reportedly grew over the years to include neighbors as well. For 200 years von Buskirk's descendants lived on the property as the world changed around them. The family sold a portion of the land to the Hazard Powder Company in 1798, probably one of the first signs of heavy industry in the area. Real estate speculation and the attendant population growth spurred the communities of Constable Hook, Bergen Point, Salterville and Centerville to unite as Bayonne in 1861. The Central Railroad of New Jersey laid tracks into the city, bringing even more industrialization. And finally, in 1872, John D. Rockefeller's Standard Oil Company became the first of several refiners to settle on Constable Hook, attracted by its key position on New York Bay. You have to wonder if the spirits of Pieter and Tryntje von Buskirk wander the streets of Bayonne looking for their homestead, and perhaps the gulls of Bird Point. Maybe they gain some solace from the restored wetlands near the waterfront walkway, or perhaps they've found some peace in their ultimate resting place, though not on their own family property. All hail the King (rail) of Bayonne! Wow, was all I could say. I went to Bayonne to find a new species for my New Jersey birding list, and I was astounded by what else I found. The New Jersey birding community has been abuzz with the sighting of a King rail near the Hudson River Waterfront Walkway, a natural oasis of sorts nestled among the city's shipping terminals and oil tanks. Finding rare avian visitors in industrialized areas is no real shock for local birders - as we've found often in Hudson County, pockets of nature thrive where some would assume it to be impossible, and water quality has improved enough to host wildlife. I wasn't quite sure what I'd find there, but I was prepared for just about anything. Maps of the area showed a good-sized green area labeled "Bayonne Golf Club" on a tract of land jutting into upper New York Bay. Rather than looking into it before my trip, I just headed out, road directions in hand. As for the King rail, it's a rarer visitor to New Jersey's marshes than the species usually seen here, the Clapper rail. Well, it's usually more "hearing" than "seeing": secretive by nature, rails generally live among the reeds and grasses of wetlands, frustrating birders by their clapping calls. (Needless to say, rails are masters at the game of Marco Polo.) If you're going to see them at all, it's likely to be at low tide as they come out to feed on crustaceans and insects. Clappers tend toward saltwater marshes, while Kings are freshwater birds, with the two species sometimes sharing space (and cross mating) in brackish marshes. Bayonne, located on the bay where Hudson River and Atlantic Ocean waters meet and mix, is apparently geographically desirable for Kings and Clappers. After a wrong turn that landed me in Bayonne's Marine Ocean Terminal, I found parking for the Walkway in a strip mall lot. I was barely out of my car when I saw a binocular-wearing couple coming off the path. "Here for the rail?" one asked. Just down the path a bit, alongside the long bridge, he told me, adding that other birders were still there. The usual rule was in force: when in doubt where to find a chase bird, look for the crowd. 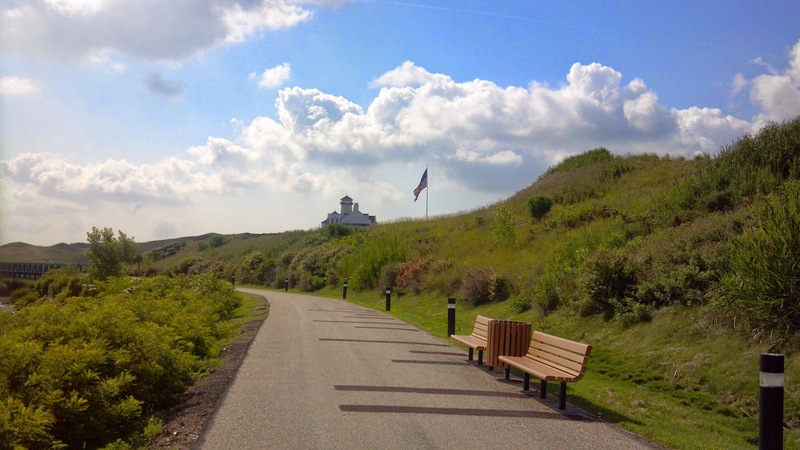 The walkway winds along the northern edge of what's traditionally known as Constable Hook, with an inlet on one side and a reclaimed landfill on the other. This, as I discovered, was no typical capped landfill, but more on that in a moment. The wild grasses and flowers on the undulating slope put me in the mind of Scotland or Ireland, and the goldfinches perching on the thistles had to agree that someone had done a good job of making a nice habitat. I noticed a few egrets in the inlet to my left, patiently waiting for an early lunch to swim by. The farther I walked along, the more the pieces came together. 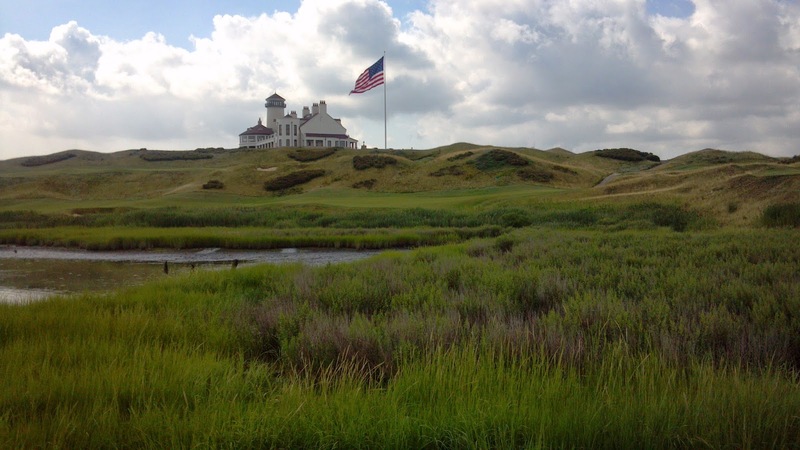 The "Bayonne Golf Club" I'd seen on the map isn't a city owned course; it's an all-out exclusive country club, modeled after the traditional links courses in Scotland. At the crest of the hill was a large, expensive-looking clubhouse with a huge American flag flying beside it. According to designer Eric Bergstol, as quoted on Golf.com, the economics of converting the landfill and doing the necessary wetlands mitigation blew the concept of a low-cost public links course out of the water, so it appears he hit for the fences. Bulldozer-sculpted hills and dales are lined by grasses, shrubs and flowers recommended by a Rutgers agronomist, all within the backdrop of Manhattan, the Statue of Liberty and the container cranes of the port. As part of the deal, the developers were required to provide public access to the waterfront, hence the walkway. 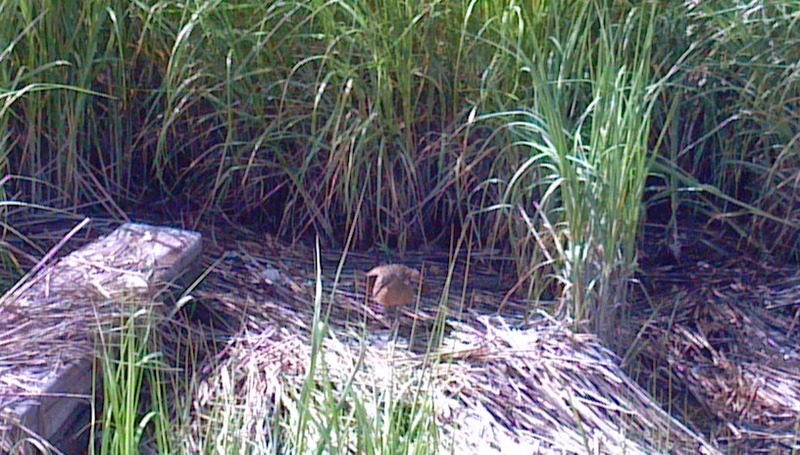 The King rail had found a home in a most regal environment. Fortunately, if a rule of finding chase birds is to find the crowd, the next rule is to look wherever you see someone aiming their optics. As I crossed the bridge on the walkway, I encountered a man with a viewing scope aimed between the railing and support struts. Maybe he had the rail? I walked up slowly, figuring not to scare it if it was there. It wasn't, but the consolation was a very cooperative Yellow-crowned night heron, plus more specific guidance on the rail's whereabouts. It wasn't much farther - maybe 100 feet. Two birders were on the site as I arrived, waiting for the secretive rail to emerge from the grass to forage on the small patch of mud to the side of the bridge. A little farther down, where a wider mudflat held a stream, they'd seen a rail chick who was a bit less shy, and in the distance they'd noticed a Clapper rail. Yup, that's the King rail, right in the middle. Knowing I wouldn't be able to differentiate a King rail chick from a Clapper rail chick, I decided to wait the adult King out by the mud patch. A moment or two later, I noticed some movement in the grass, just behind the first layer of reedy grass. Looking closer, I was pretty sure it was the King (overall, they're a rustier shade than their cousins), but it was tough to tell because he was preening. I wasn't going to let that be the sum of my first-ever look at his species, so I sat down to wait, staring at that patch of grass as the occasional golf cart whirred past behind me. It may sound crazy, but in situations like that, I like to send a mental message to the bird, letting him know it's safe and I just want to admire him. Sometimes it works; other times it rises to levels of frustration that nearly lead me to a Sheldon Cooper-type tantrum. Are we in golf heaven? No, Bayonne. This time it worked. Like an actor coming onstage, the rail emerged from the curtain of grass to walk to an open area where I could see him completely. Stopping, he posed with his wings raised above his back, as if to air them. Then, like a model, he walked a few more steps and turned, allowing me to see the rest of him as I committed him to memory. Just as I was thanking the bird for being so cooperative, a golf cart stopped behind me and the King ducked back into the grass. Two course employees were wondering why so many binocular-toting people had been standing around the bridge for the past few days. Pulling out my Sibley guide to show them, I explained the significance of the rail and complimented them on the golf club's work to create a good environment for birds. It didn't occur to me until now that the rail was as much of a VIP (or VIB) as any of the club's members, and he didn't require use of the club's exclusive boat or helicopter to get to the links. We didn't see any pandas on our last trip to New Brunswick, but I honestly wouldn't have been shocked if we had, based on what we found. Toward the end of our recent visit to Rutgers Gardens, we found ourselves in a less showy part of the property. A greenhouse, service buildings and a tractor or two got me thinking that we might have inadvertently walked into an area where visitors weren't encouraged to go. No signs were warning us away, so we figured we'd keep going until they did. Then, at a point, the usual New Jersey-type overgrowth of shrubs, grass and vines evolved into a monoculture of bamboo. I mean, a LOT of bamboo. "This can't be a coincidence" quantities of bamboo. A break in the exotic wall of greenery drew us onto a footpath arched by distinctly Asian overgrowth. We'd stumbled upon Rutgers Gardens' real secret: its one acre bamboo forest. Neither Ivan nor I had ever seen a grove of bamboo so expansive, except maybe at a zoo somewhere. As we continued our exploration, a winding path brought us to a rocky brook crossed by a simple wooden footbridge. I half expected to find a Zen sand garden, or perhaps a statue of a sitting Buddha nestled somewhere, but all we found was green foliage and the gentle babble of water streaming by. The grove's species, Phyllostachys nuda, is known as running bamboo for its tendency of spreading aggressively if it's not hemmed in by concrete or water barriers. While that creates challenges for gardeners, it's a boon to the environment: the faster a plant grows, the more carbon dioxide it removes from the atmosphere. Native to China's Zhejiang province, this evergreen plant can withstand temperatures as low as -15 degrees Fahrenheit, making it more than suitable to New Jersey's climate. Growers in Idaho have seen the species do well in areas where temperatures dip into the -30 degree Fahrenheit range. How did bamboo get to Rutgers, and why? According to the Gardens' website, a small grove was originally planted on site in the 1940s as a winter home for honeybee colonies. Maybe it wasn't intended to become the forest it's grown to be, but Rutgers is making the best of it: once a culm (as the stalks are called by botanists) reaches the end of its five to seven year lifespan, it's removed in order to let a newer, healthier one take its place. The cuttings are sold during the Gardens' annual spring flower fair in May. Considering that a new culm can grow to a height of 30 feet in just a few weeks, any bare patches in the grove are filled pretty quickly. Every culm around us looked healthy and about two inches around at most; a good knock on a few revealed a very solid report, similar to what you'd hear from a good quality tree wood. Rutgers might be missing out on an opportunity here: combine rampant bamboo with the seemingly ubiquitous Phragmites growing in marshes and on roadsides, and you've got building and roofing material in abundance. In any case, we're getting ahead of ourselves. 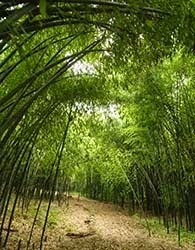 The Rutgers bamboo grove is beautiful just as it is: a quiet, out of the way place to relax and contemplate life, and an authentic Zen-type experience. Save the plane fare to the Far East: bamboo heaven is just a few miles from Turnpike interchange 9. 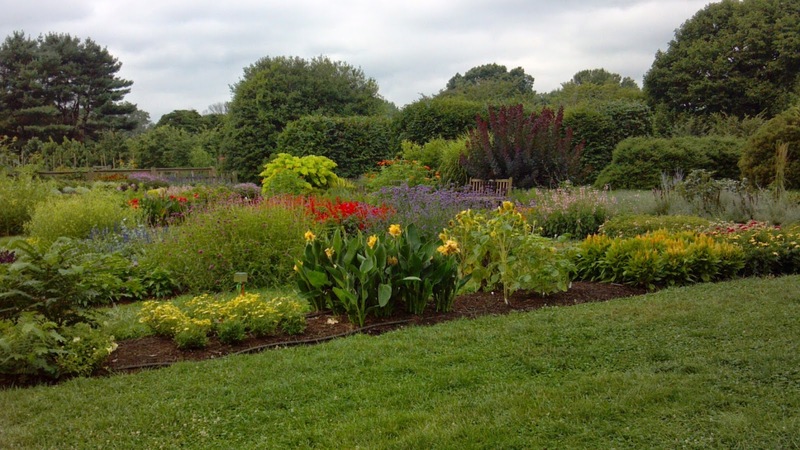 For a while, we've been meaning to get to Rutgers Gardens, the 180-acre bit of bliss located not far off Route One on Ryders Lane in New Brunswick. It's tucked so securely away from the hubbub of the University that many New Jerseyans, let alone Rutgers students and alumni, know about it. Though I visited once or twice during my college years, I honestly forgot exactly where it was and how to get there. Directional signage from the major campuses is virtually non-existent, and if there's any indication from the highway, I must have missed it. In any case, I had visions of beautiful flowering gardens, well-kept trees and shrubs, and maybe a Rutgers-bred hybrid or twenty in the mix. Given that the WPA-built Log Cabin building on the grounds is a popular wedding reception site, I figured odds were good that we'd see a newly-married couple posing amid the greenery. The recently hitched folks weren't there yet, but the gardens didn't disappoint. Ivan and I visited on a cloudy August morning, hoping to dodge the rain that was supposed to fall sporadically through the day. We basically had the place to ourselves, give or take a dog walker or two, but it was still early. Consistent with Rutgers' leadership in holly breeding, visitors are greeted to the site by the nation's second largest American holly collection as they drive onto the grounds. Not far away is an impressive variety of shrubs, leading Ivan to comment that RU had missed its chance to rename its mascot the Scarlet Knight who says NI! (Bring them a shrubbery, anyone? Anyone?) Evergreens, ornamental trees and rhododendrons all get extensive space, too. Stopping by a cheery potting shed that doubles as a gift shop and information desk, we met a friendly volunteer who filled us in on the latest. The gardens were started in the 1920's as a teaching tool for students in the plant sciences and has evolved over the years to include a broad range of species. Though the land and buildings are owned by the University, the gardens are totally self-sustaining, gaining their revenue from facility rentals and events like farm markets, classes, tours and membership fees, which enables them to offer free admission to the property. In fact, we just missed the annual open house, a major fundraiser that included tours, discussions with horticulturists, a wine tasting and plant sale. 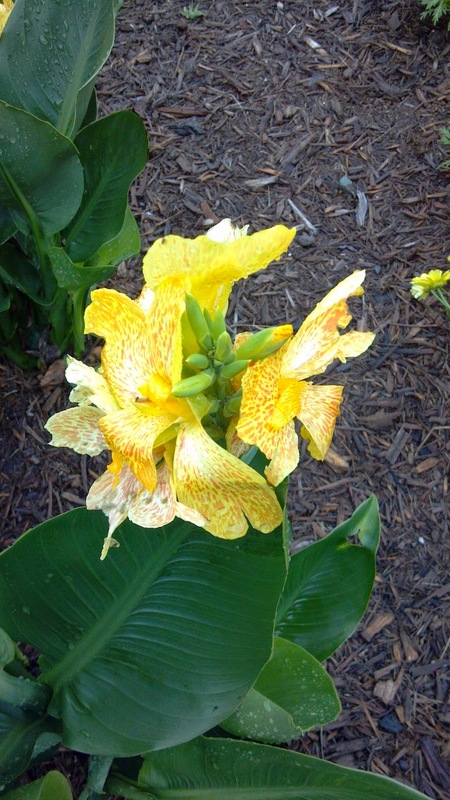 The showiest area of the property is the Donald B. Lacey Display Garden, named for the state agricultural extension specialist in horticulture who converted it from a huge bearded iris collection to a display of annuals the home gardener can grow in his or her own plot. To celebrate the display's 50th year, Rutgers Gardens' "Best in Show, Sun to Snow" theme highlights what the staff feels are the best species of annuals, perennials and vegetables to grow in New Jersey. The selections change regularly to reflect the growing and blooming seasons for each species. Just behind a locked gate was a large volunteer-run vegetable garden with tomatoes and all sorts of summer squash ripening tantalizingly. Hikers looking for a less manicured bond with nature can check out the Frank G. Helyar Woods, a 70 acre old-growth forest of beech, hickory and oak trees. Unfortunately the well-marked 2.5 mile path was blocked by a felled tree about 20 yards in, preventing us sandal-shod explorers from trekking much further. Maybe another day, with more energy and wearing more suitable gear, we'll check it out again; it's said to be a nice jaunt out to Weston's Mill Pond and an abandoned Christmas tree farm left to grow on its own. As we looped around the back end of the Gardens, we found another forest with a more passable trail, but that's a story for next time. Stay tuned!